VFOM has a new board president! | Virginia Friends of Mali VFOM has a new board president! | Creating and promoting educational and cultural pathways to understanding and cooperation between the peoples of the African nation of Mali and the State of Virginia, USA. 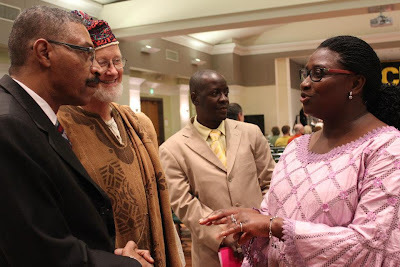 FOM new president, Lydie Alapini-Sakponou, in 2012, with then Malian Ambassador Mamoun KEITA, Segou Project Manager Robin Poulton and the ambassador’s Chief of Protocol, during our annual National Mali Day program. The board also welcomed a new category, Student Board Member, and with it three new members from Virginia Commonwealth University, all of whom worked tirelessly to make the Africa Business Conference a success. Click here to see the full 2017-2018 board roster.